I’ve been camping for more then 10 years now and have bought a number of camping “gadgets” over the years such as the Swedish Firesteel. 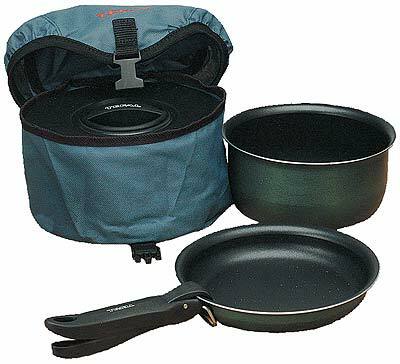 But the best piece of equipment I ever purchased, aside from a tent, is my T-Fal Camping Pots. I’ve had my set for 7 years and every time I use them I’m amazed at the design and quality. The whole set, which includes, two pots and two frying pans, stacks into one another to make a nice little package. A removable clamping handle is provided and tucks away into a pouch under the top of the carrying bag. The pots are intended for camping stoves only. Of course being T-Fal they are all non-stick coated which makes cleaning up a breeze. I even use the frying pans on the BBQ to sauté vegetables while I’m cooking meat. If you are going camping for some weekend fun consider picking up these lightweight, compact, non-stick pans. You will be glad you did. WE HAVE THIS SET AND WE LOVE IT TOO! this summer we were at Algonquin park camping and i misplaced the handle! do you have any information on how to purchase a replacement handle? thanks for your help.